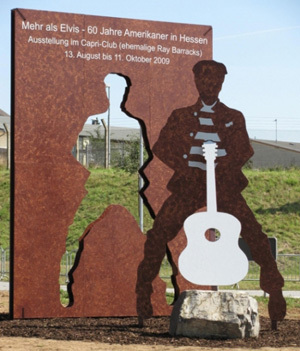 Elvis Monument In Friedberg - Misc. From now on, the first thing you'll see if you enter the city, is a large Jailhouse Rock silhouette of Elvis. At this time, the monument serves also as a billboard for the expo in the Capri Club that ends on October 11. The monument itself will stay when the expo closes. My German isn't too good, but I'm sure the sign reads "Elvis opened his bowels here" - hence the silhouette. But don't quote me on that. Not sure if I am going to visit this.. Very different style monument – makes a nice change! Any German/English speakers tell us what the inscription says please? Thanks!